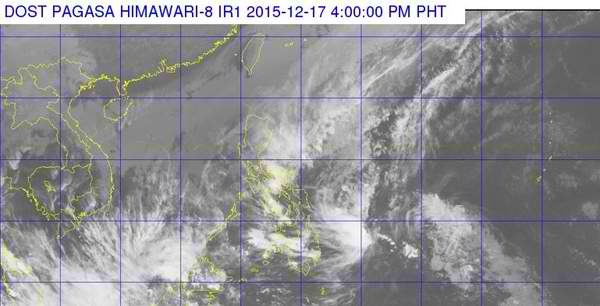 Bagyong ONYOK Updates, Forecast, Storm Signals and Track (December 18, 2015) | #OnyokPH - Balita Boss! Philippine Atmospheric, Geophysical and Astronomical Services Administration (PAGASA) said on Wednesday afternoon, December 16, that tropical depression east of Mindanao has entered the Philippine area of responsibility and was named "Onyok". Here's the weather updates on Bagyong ONYOK from the state weather bureau. According to the weather advisory of PAGASA, issued at 5:00 p.m., the center of Bagyong ONYOK, as of 5:00 p.m., was estimated based on all available data at 210 km East of Mati City, Davao Oriental (7.3°N, 128.1°E) with maxiimum sustained winds of 45 kph near the center. It is forecast to move West at 18 kph. Surigao del Sur including Siargao Island, Surigao del Norte, Dinagat Province, Misamis Oriental, Camiguin, Agusan del Norte, Agusan del Sur, Davao Oriental, Davao del Norte, Compostela Valley, Bukidnon, Lanao del Norte, Lanao del Sur, Misamis Occidental, Davao del Sur, Maguindanao and North Cotabato. 50 km Southwest of Zamboanga City (as a Low Pressure Area). For latest updates, kindly check below the Tweets about "#OnyokPH" .